The National Rifle Association has always been clear about drugs: They’re terrifying. Last year, NRA CEO Wayne LaPierre darkly warned that members of drug gangs “are infiltrating law enforcement and even the military.” In 2013, LaPierre proclaimed that “Latin American drug gangs have invaded every city of significant size in the United States,” and are a key part of the “hellish world” that awaits us in the future. When Charlton Heston was president of the NRA in the 1990s, he declared that regular Americans would soon be besieged by 10,000 drug dealers freed from prison by the Clinton administration. 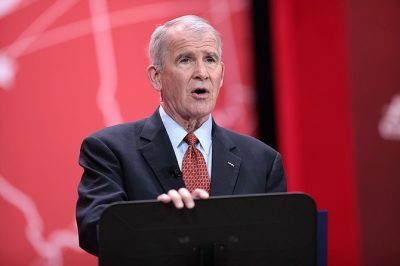 It seems odd, then, that the next president of the NRA will soon be Oliver North, who spent years in the 1980s working together with large-scale cocaine traffickers and protecting a notorious narco-terrorist from the rest of the U.S. government. This reality about North has been largely covered up, first by North himself and then by Fox News and the passage of time. Thirty years later, it’s been almost totally forgotten. But the facts remain genuinely appalling. North was an active-duty Marine when he joined the Reagan administration’s National Security Council in 1981. One of Reagan’s top priorities was organizing and funding the Contras, a guerrilla military force, to overthrow the revolutionary socialist Sandinista government of Nicaragua. But the Contras engaged in extensive, gruesome terrorism against Nicaraguan civilians. Congress gradually reduced and then eliminated appropriations supporting them, leading the Reagan administration to secretly search for money elsewhere. North enthusiastically looked for cash wherever he could find it, and led many of the clandestine schemes that later became known as the Iran-Contra scandal. The Sultan of Brunei donated $10 million (which North’s secretary Fawn Hall accidentally wired to the wrong Swiss bank account), and Saudi Arabia ponied up as well. North also pushed what he called “a neat idea”: selling U.S. military equipment to Iran, with the proceeds passed along to the Contras. Meanwhile, the Contras had a neat idea of their own: facilitating cocaine trafficking through Central America into the U.S., with a cut going toward supporting their war against the Sandinistas. Some Contras were themselves cocaine traffickers, and others were simply happy to make alliances of convenience with drug cartels. There’s no evidence North actively wanted cocaine to be smuggled into the U.S. It was simply that he had other priorities. But was he aware of the Contras’ drug trafficking? Yes. Did he try to shield one of “his” cocaine traffickers from consequences from the other branches of the U.S. government? Yes. Did he work together with a known drug lord? Yes. All in all, North’s connections to drug trafficking were so egregious that in 1989 he was banned from entering Nicaragua’s neighbor Costa Rica by Oscar Arias, the country’s president and 1987 recipient of the Nobel Peace Prize. But despite North’s cover-up, what we do know for sure is incredibly damning. The North-Noriega operation ultimately didn’t come to fruition; the Iran-Contra affair was exposed just two months after they met. But the planning that did occur is conclusive evidence that North eagerly worked with drug dealers operating on the largest scale imaginable. In 1984, José Bueso Rosa, a Honduran general, plotted with several others to assassinate the president of Honduras. They planned to fund the hit with the proceeds from selling 760 pounds of cocaine in the U.S. The FBI, however, had the participants under surveillance, intercepted the shipment when it arrived at a small airfield in Florida, and arrested everyone involved. North didn’t get everything he wanted, but did succeed in having Bueso transferred to a “Club Fed” minimum security prison. Bueso was released on parole after 40 months. There are also numerous documented examples of North being informed that members of the Contras were involved in drug trafficking, with no signs that North took any action. For instance, after meeting with a key assistant, North wrote in his notebooks about a plane being used by the brother of a top Contra leader to ferry supplies from the U.S. to Central America. North testified in front of Congress that he’d passed this information along to the Drug Enforcement Administration. When later questioned by the Washington Post, the DEA, the State Department, and the U.S. Customs Service all stated that there was no evidence North ever said anything about the matter to them.